In this lovely season of June, I am delighted to welcome all of you to the picturesque city of Qingdao for the 18th meeting of the Council of Heads of Member States of the Shanghai Cooperation Organization (SCO). Over 2,500 years ago, Confucius, the great Chinese philosopher, had this to say: "What a joy to have friends coming from afar!" It is therefore of special significance that I host my distinguished guests in Shandong, the home province of Confucius, for a summit that will chart the future course for the SCO. In five days, the SCO will celebrate its 17th birthday, an occasion for us to review our organization's remarkable journey and important achievements. Over the past 17 years, guided by the SCO Charter and the Treaty on Long-Term Good-Neighborliness, Friendship and Cooperation Between the Member States of the Shanghai Cooperation Organization, we have forged a constructive partnership featuring non-alliance, non-confrontation and not targeting any third party. In doing so, we have achieved a major breakthrough in the theories and practices of international relations, created a new model for regional cooperation, and made new contribution to peace and development in our region. Today, the SCO stands as a comprehensive regional cooperation organization that covers the largest area and population in the world. Its members account for about 20 percent of the global economy and 40 percent of its population. The SCO has four observer states and six dialogue partners as well as extensive cooperation linkages with the United Nations and other international and regional organizations. With its ever rising international influence, the SCO has become an important force for promoting global peace and development and upholding international justice and fairness. The SCO enjoys strong vitality and momentum of cooperation. This, in the final analysis, is attributed to the Shanghai Spirit, a creative vision initiated and followed through by the SCO that champions mutual trust, mutual benefit, equality, consultation, respect for diversity of civilizations and pursuit of common development. The Shanghai Spirit, transcending outdated concepts such as clash of civilizations, Cold War and zero-sum mentality, has opened a new page in the history of international relations and gained increasing endorsement of the international community. Mencius, another ancient Chinese philosopher, aptly observed, "When Confucius looks down from the peak of the Dongshan Mountain, the local Kingdom of Lu comes into view; when he looks down from the peak of Mount Tai, the whole land comes into view." At a time when the world is undergoing major developments, transformation and adjustment, we must aim high and look far, and keep pace with the underlying trend of both the world and our times to push for more progress of human civilization. While hegemony and power politics still persist in this world, the growing call for a more just and equitable international order must be heeded. Democracy in international relations has become an unstoppable trend of the times. While various traditional and non-traditional security threats keep emerging, the force for peace will prevail, for security and stability are what people long for. While unilateralism, trade protectionism and backlash against globalization are taking new forms, in this global village of ours where countries' interests and future are so interconnected, the pursuit of cooperation for mutual benefit represents a surging trend. While we keep hearing such rhetoric as the clash of civilizations or the superiority of one civilization over another, it is the diversity of civilizations that sustains human progress. Indeed, mutual learning between different cultures is a shared aspiration of all peoples. The world today faces both opportunities and challenges. The road ahead, bumpy as it may be, will lead to a promising future. We should stay committed to the Shanghai Spirit, surmount difficulties, defuse risks and meet challenges head on. -- We should uphold innovative, coordinated, green, open and inclusive development, achieve coordinated social and economic progress of various countries and resolve issues caused by unbalanced development. We should bridge the gap in development and promote shared prosperity. -- We should pursue common, comprehensive, cooperative and sustainable security. We should reject the Cold War mentality and confrontation between blocs and oppose the practices of seeking absolute security of oneself at the expense of others, so as to achieve security of all. -- We should promote open and inclusive cooperation for win-win outcomes. We should reject self-centered, short-sighted and closed-door policies. We should uphold WTO rules and support the multilateral trading system so as to build an open world economy. -- We should champion equality, mutual learning, dialogue and inclusiveness between civilizations. It is important that we overcome cultural misunderstanding, clash and supremacy through exchanges, mutual learning and coexistence. -- We should follow the principle of achieving shared growth through discussion and collaboration in engaging in global governance. We should reform and improve the global governance system, and work with all other countries to build a community with shared future for humanity. First, we need to build up strength of unity and mutual trust. 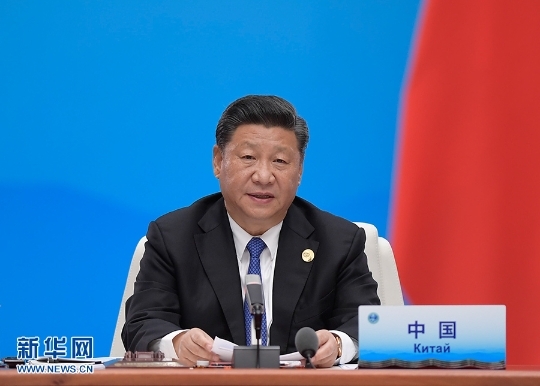 We should ensure full implementation of the Qingdao Declaration, the Outline for the Implementation of the Treaty on Long-Term Good-Neighborliness, Friendship and Cooperation, and other documents. We should respect each other's choice of development paths and accommodate each other's core interests and major concerns. We should enhance mutual understanding by putting ourselves in others' positions and boost harmony and unity by seeking common ground and setting aside differences. This will enhance the cohesion and appeal of our organization. Second, we need to strengthen the foundation for shared peace and security. We need to actively implement the 2019-2021 program of cooperation for combating "three evil forces" of terrorism, separatism and extremism, continue to conduct the "Peace Mission" and other joint counter-terrorism exercises, and enhance cooperation on defense security, law enforcement security and information security. We need to give full play to the role of the SCO-Afghanistan Contact Group to facilitate peace and reconstruction in Afghanistan. China offers to train 2,000 law enforcement officers for all parties in the next three years through China National Institute for SCO International Exchange and Judicial Cooperation and other platforms to enhance law enforcement capacity building. Third, we need to build a powerful engine to achieve common development and prosperity. We should increase complementarity of our respective development strategies, continue to advance the Belt and Road cooperation under the principle of delivering shared benefits through extensive consultation and joint contribution, accelerate regional trade facilitation, and step up the implementation of the Agreement on International Road Transport Facilitation and other cooperation documents. China will welcome all parties to the first China International Import Expo to be held in Shanghai in November this year. The Chinese government supports building a demonstration area in Qingdao for China-SCO local economic and trade cooperation, and will set up a committee of legal services for SCO member states to provide legal support for business cooperation. In this connection, I hereby announce that China will set up an RMB 30 billion equivalent special lending facility within the framework of the SCO Inter-bank Consortium. Fourth, we need to forge closer ties through cultural and people-to-people exchanges. We should actively implement the outline for environmental protection cooperation and other documents, ensure the continued success of such well-recognized programs as the youth exchange camp, and secure solid progress in cooperation in education, science and technology, culture, tourism, health, disaster relief and media. In the next three years, China will provide 3,000 training opportunities of human resources development for SCO member states to enhance public understanding of and support for the SCO family. China offers to provide meteorological services to all parties using its Fengyun-2 weather satellites. Fifth, we need to expand partnership networks of international cooperation. By intensifying exchanges and cooperation with SCO observer states, dialogue partners, and other countries in our region, by enhancing partnerships with the United Nations and other international and regional organizations, and by engaging in dialogue with the International Monetary Fund, the World Bank and other international financial institutions, we can contribute our share to resolving hotspot issues and improving global governance. Thanks to the support and assistance of all the other SCO member states over the past year, China has completed its SCO presidency and hosted this summit. Here I wish to express my sincere thanks to you all. China will maintain active, practical and friendly cooperation with other SCO member states to ensure the full implementation of the consensus reached at this summit and support Kyrgyzstan in its SCO presidency. Let us join hands to create an even brighter future for the SCO!